"The Moleskine Large Sketchbook" is bound in cardboard, with a 'moleskine' cover having rounded corners and an elastic enclosure. The 100 top-quality acid-free pages are thread bound, and the notebook includes an expandable inner note holder made of cardboard and cloth. 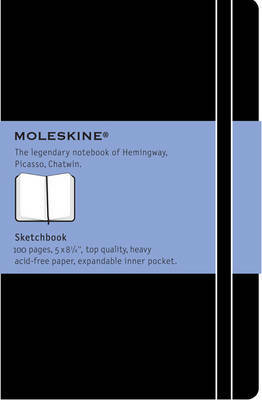 Each Moleskine journal has a ribbon placeholder and removable card with the history of Moleskines.